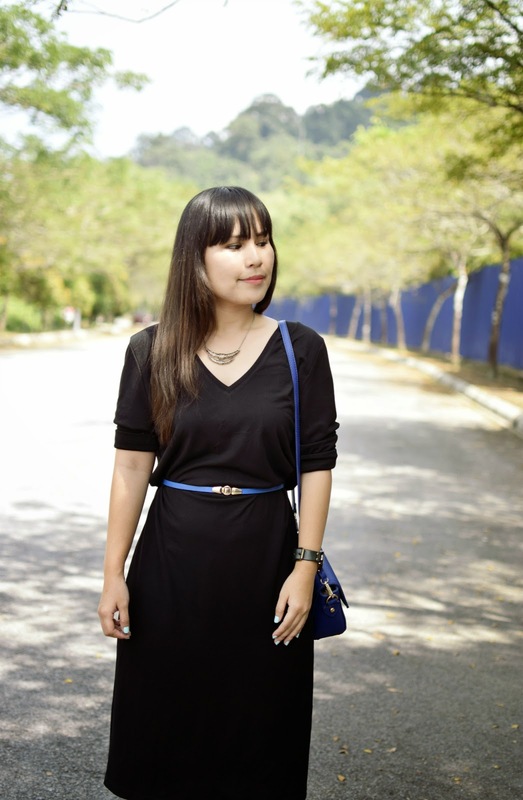 Outfit Diary : Black Love | Tips on how to wear black dress? Happy Sunday to you from me. I'm late for my church service today. Its not something that very proud to tell but lesson learned here, never late again!be punctual, my body and mind. Move on from that bad example.. moving on to topic that I love the most. Its about clothes, more clothes and more clothesss. I am crazy in love with clothes!! Whenever I saw pretty or any clothes, my mind will go wild to think of any pairing I can do with it and if the pairing more than five in my mind, I will buy the clothes. Tips from clothes lover like me, buy clothes that you can wear in my styles. I bought this dress from vintage shop for RM20, very cheap, right? I love the V neck and the length..oh gosh! I feel its totally worth to buy it. This time, I wore it as simple dress for Church. 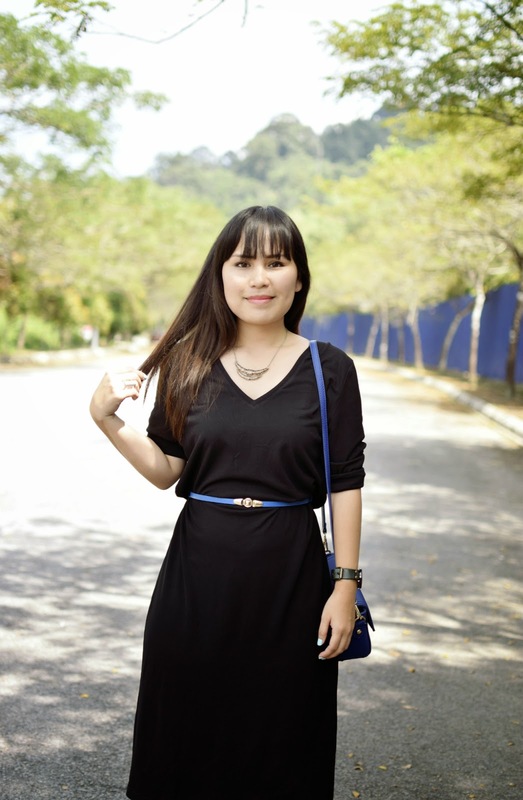 I will share five(5) tips to wear black dress, so click more.. Tips #1 : Wear all black dress can be very tricky, you don't want to look like go to funeral, so I suggest add some fun color with it. For me, I love blue so I add blue and blue on this pairing. What I love about black dress is I can pairing it with whatever color I wanted. Because I am late, so I don't have time to change to my heels, so I just wear my flat. I don't drive with my heels because I feel not safety driving with my heels. First pose with my heels.. I love this look more..ahha, sorry my flats. Tips#2 : If the dress is too long for you, don't cut it first. What you can do is pull up the dress until your desire length and the belt will hold it. This pose is must for my outfit shoot. Okay, I must admit that, have a bangs most difficult hairstyle because the hair keep falling apart because they not used to this style.. I need to be patient of this. Tips#3 : If you're accessories lover, then wear black with your accessories is totally hit! I love wearing gold color accessories with black because I just love the combination of color.
" Whatever your dreams, just do it, work hard toward it, do your very best and never give up!" Tips #4 : If you have round face like mine, whenever you choose t-shirt or whatever, if possible choose the V neck because it can make illusion of longer face. Tips#5 : Be confident and feel good with whatever you wear. Not only expensive clothes makes you happy, you are the one can make yourself happy. When you feel confident, you will look confident and always feel good whenever you wear your clothes. I always believe, whenever we feel good about ourselves, people will feel the good vibes. I feel so happy whenever I make time for something I love. 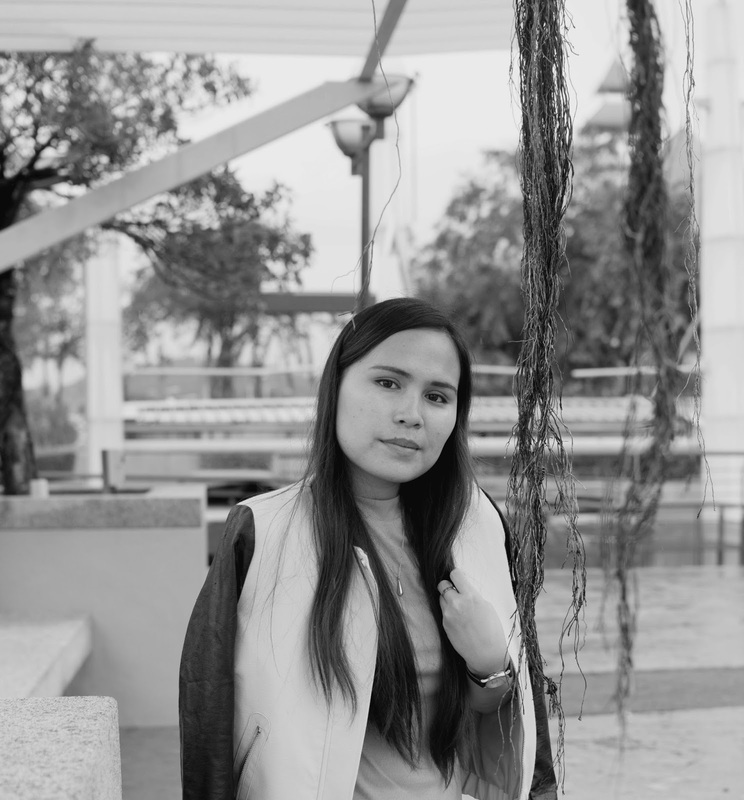 And, I am thankful for my friends that always helping me for taking my photos even though I always said " can we do like this and like that?, can you holding the camera like this and blah blah".. Thanks friends for make me smile, I will try my best to make you smile on your dreams. Please pray for my journey and see you on next post! Thank you very much for visit and read my blog. Have a nice day and God bless you always.